The general public will likely never know just what caused a North Korean rocket to crash and burn on Friday (April 13), one expert says. North Korea went ahead with the controversial launch of its long-range Unha-3 rocket despite warnings from the United States and other nations, which viewed the event as a thinly disguised military missile test. 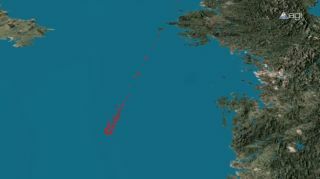 The Unha-3 was supposed to deliver an Earth-observing satellite to orbit, according to North Korean officials, but it broke apart and pitched into the sea shortly after liftoff. While American intelligence officials may already know what went wrong, the rest of us will probably never get the full story, according to Brian Weeden, a technical adviser with the Secure World Foundation and a former orbital analyst with the U.S. Air Force. "It’s also very hard to speculate what went wrong, as I’ve heard conflicting reports about whether the event happened while the first stage was burning or at second-stage ignition," he added. The Unha-3 failure was the fourth long-range rocket flop in a row for North Korea, whose secretive, unpredictable nature and status as a nuclear-armed nation have long concerned the West. In 1998, the Hermit Kingdom attempted its first satellite launch with a rocket called Taepodong-1. North Korean officials claim the blastoff was a success, but Western observers say the satellite never made it to orbit. A 2006 test flight of the Taepodong-2 also did not go well, with the rocket exploding just 40 seconds after liftoff. And a second satellite launch in 2009, using an advanced, three-stage variant of the Taepodong-2 called Unha-2, failed as well. The rocket's third stage apparently failed to ignite,experts say, and the satellite ended up at the bottom of the Pacific Ocean. The Unha-3 ("Galaxy-3") is thought to be broadly similar to the Unha-2, though not much is known about the rocket for sure. However, North Korea has been more forthcoming about this rocket launch than its past efforts. The nation invited foreign journalists to tour the Unha-3's launch site shortly before its April 13 liftoff, for example, and North Korean officials admitted the launch failure several hours after it occurred. The Unha-3 rocket was a three-stage booster that stood about 100 feet tall (30 meters) and launched from the Sohae Satellite Launching Station located in northwestern North Korea near the village of Tongchang-ri. SPACE.com staff writer Denise Chow (@denisechow) contributed to this story. You can follow SPACE.com senior writer Mike Wall on Twitter: @michaeldwall. Follow SPACE.com for the latest in space science and exploration news on Twitter @Spacedotcom and on Facebook.